Communities around the North West are warned to be prepared for possible flooding due to heavy rain. Residents are being urged to check their flood risk, be prepared and be cautious if travelling this weekend, particularly on Saturday and Sunday. Rivers in North West already affected by record river levels throughout the wettest December on record are likely to be at risk, with the potential for heavy rainfall causing river levels to rise and flooding drains. Environment Agency teams are working round the clock checking and maintaining flood defences by completing grid runs, checking flood gates and flood walls closely, clearing blockages in watercourses, monitoring water levels and will issue flood warnings where necessary. 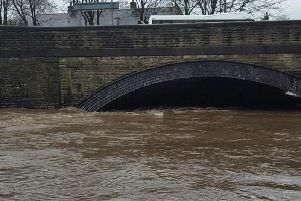 The Environment Agency are continuing to work on the ground to help communities recover from the severe floods which hit Cumbria and Lancashire last month. “We will issue flood warnings and alerts where necessary as rivers respond to the rainfall. This could also cause drains to overflow, so people need to be ready for flash flooding in some places. Environment Agency teams are already out checking flood defences, clearing trash screens and blockages in watercourses and culverts.